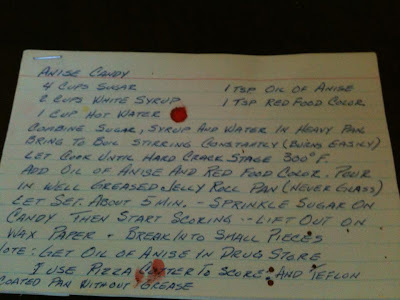 This is a recipe that was an annual favorite of mine growing up. When I got older, I was surprised to learn that not everyone eats anise (black licorice flavored) hard candy on a regular basis. So, in an effort to spread the sweetness around, I'm going to share this recipe from Granny with you all! Measure out your anise oil and food coloring before you start cooking. If you want a milder flavor, you can use anise extract in lieu of anise oil, but you should triple or quadruple the amount (I used 3 1/2 teaspoons of extract). Combine the sugar, syrup, and water in the pot with your candy thermometer inserted. Stirring constantly, bring to a boil until 300 degrees, the hard crack stage. Add the anise oil or extract and the food coloring. Beware that this will sputter a bit- wear an apron to prevent staining. Pour into a well greased jelly roll pan. Allow to cool about 5 minutes, then sprinkle generously with sugar. Score the candy with the pizza cutter and allow to cool for another minute or two. Lift the candy out of the pan and onto waxed paper. Break into smaller pieces. Store in an airtight container.